Consistently awarded the highest grade and quality rating, Appalachian Hardwoods are the lumber of choice for those who choose the best. No matter your needs, Appalachian Hardwoods make a difference in the stability and quality of your products. The members of Appalachian Hardwood Manufacturers, Inc. (AHMI) stand ready to meet your Appalachian Hardwood Lumber Resource needs. This guide is designed to help provide information about these members and shape your buying decision. 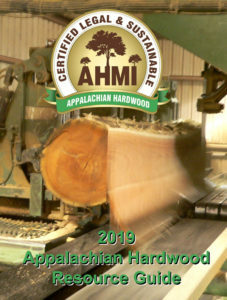 AHMI Producers are sawmill owners and operators in the Appalachian Region that provide green and kiln dried Appalachian Hardwood lumber, logs and wood products. AHMI Distributors are distribution yards and wholesalers across the United States and Canada that provide green and kiln dried Appalachian Hardwood lumber in a variety of species and specifications. Export Division is producers and distributors who export lumber and logs. Forestry members include landowners and consulting foresters. Consumer members are manufacturing companies that utilize Appalachian Hardwoods. Supplier members are companies that supply goods and services to the forest products industry.